Contributor Adrianotrapani created this magnificent video from western Siberia in Russia. 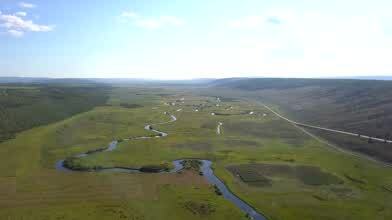 It was shot in a district of the Irkust Oblast, which lies just to the west of Lake Baikhal. The video was shot along the Lena River, one of the three great rivers which drain Siberia into the Arctic Sea. Drawing from the same watershed as Lake Baikhal (the world's largest freshwater lake measured by water volume), the waterway runs over 4.3k mi. (almost 2.7k mi. ), forming a giant delta in the Laptev Sea in the Arctic Circle.